Charlie Chaplin was a comedic British actor who became one of the biggest stars of the 20th century's silent-film era. SynopsisBorn on April 16, 1889, in London, England, Charlie Chaplin worked with a children's dance troupe before making his mark on the big screen. His character "The Tramp" relied on pantomime and quirky movements to become an iconic figure of the silent-film era. Chaplin went on to become a director, making films such as City Lights and Modern Times, and co-founded the United Artists Corporation. He died in Corsier-sur-Vevey, Vaud, Switzerland, on December 25, 1977. Early LifeFamous for his character "The Tramp," the sweet little man with a bowler hat, mustache and cane, Charlie Chaplin was an iconic figure of the silent-film era and one of film's first superstars, elevating the industry in a way few could have ever imagined. Born Charles Spencer Chaplin in London, England, on April 16, 1889, Charlie Chaplin's rise to fame is a true rags-to-riches story. His father, a notorious drinker, abandoned Chaplin, his mother and his older half-brother, Sydney, not long after Chaplin's birth. That left Chaplin and his brother in the hands of their mother, a vaudevillian and music hall singer who went by the stage name Lily Harley. Chaplin's mother, who would later suffer severe mental issues and have to be committed to an asylum, was able to support her family for a few years. But in a performance that would introduce her youngest boy to the spotlight, Hannah inexplicably lost her voice in the middle of a show, prompting the production manager to push the five-year-old Chaplin, whom he'd heard sing, onto the stage to replace her. Chaplin lit up the audience, wowing them with his natural presence and comedic angle (at one point he imitated his mother's cracking voice). But the episode meant the end for Hannah. Her singing voice never returned, and she eventually ran out of money. For a time, Charlie and Sydney had to make a new, temporary home for themselves in London's tough workhouses. Early CareerArmed with his mother's love of the stage, Chaplin was determined to make it in show business himself, and in 1897, using his mother's contacts, landed with a clog-dancing troupe named the Eight Lancashire Lads. It was a short stint, and not a terribly profitable one, forcing the go-getter Chaplin to make ends meet any way he could. "I (was) newsvendor, printer, toymaker, doctor's boy, etc., but during these occupational digressions, I never lost sight of my ultimate aim to become an actor," Chaplin later recounted. "So, between jobs I would polish my shoes, brush my clothes, put on a clean collar and make periodic calls at a theatrical agency." Eventually other stage work did come his way. Chaplin made his acting debut as a pageboy in a production of Sherlock Holmes. From there he toured with a vaudeville outfit named Casey's Court Circus and in 1908 teamed up with the Fred Karno pantomime troupe, where Chaplin became one of its stars as the Drunk in the comedic sketch A Night in an English Music Hall. With the Karno troupe, Chaplin got his first taste of the United States, where he caught the eye of film producer Mack Sennett, who signed Chaplin to a contract for a $150 a week. Film CareerIn 1914 Chaplin made his film debut in a somewhat forgettable one-reeler called Make a Living. To differentiate himself from the clad of other actors in Sennett films, Chaplin decided to play a single identifiable character, and "The Little Tramp" was born, with audiences getting their first taste of him in Kid Auto Races at Venice (1914). Over the next year, Chaplin appeared in 35 movies, a lineup that included Tillie's Punctured Romance, film's first full-length comedy. In 1915 Chaplin left Sennett to join the Essanay Company, which agreed to pay him $1,250 a week. It is with Essanay that Chaplin, who by this time had hired his brother Sydney to be his business manager, rose to stardom. During his first year with the company, Chaplin made 14 films, including The Tramp (1915). Generally regarded as the actor's first classic, the story establishes Chaplin's character as the unexpected hero when he saves the farmer's daughter from a gang of robbers. By the age of 26, Chaplin, just three years removed from his vaudeville days, was a superstar. He'd moved over to the Mutual Company, which paid him a whopping $670,000 a year. The money made Chaplin a wealthy man, but it didn't seem to derail his artistic drive. With Mutual, he made some of his best work, including One A.M. (1916), The Rink (1916), The Vagabond (1916) and Easy Street (1917). Through his work, Chaplin came to be known as a grueling perfectionist. His love for experimentation often meant countless takes, and it was not uncommon for him to order the rebuilding of an entire set. Nor was it uncommon for him to begin filming with one leading actor, realize he'd made a mistake in his casting and start again with someone new. But the results were hard to refute. During the 1920s Chaplin's career blossomed even more. During the decade he made some landmark films, including The Kid (1921), The Pilgrim (1923), A Woman in Paris (1923), The Gold Rush (1925), a movie Chaplin would later say he wanted to be remembered by, and The Circus (1928). The latter three were released by United Artists, a company Chaplin co-founded in 1919 with Douglas Fairbanks, Mary Pickford, and D.W. Griffith. Off-Screen DramaChaplin became equally famous for his life off-screen. His affairs with actresses who had roles in his movies were numerous. Some, however, ended better than others. In 1918 he quickly married 16-year-old Mildred Harris. The marriage lasted just two years, and in 1924 he wed again, to another 16-year-old, actress Lita Grey, whom he'd cast in The Gold Rush. The marriage had been brought on by an unplanned pregnancy, and the resulting union, which produced two sons for Chaplin (Charles Jr. and Sydney) was an unhappy one for both partners. They divorced in 1927. In 1936, Chaplin married again, this time to a chorus girl who went by the film name of Paulette Goddard. They lasted until 1942. That was followed by a nasty paternity suit with another actress, Joan Barry, in which tests proved Chaplin was not the father of her daughter, but a jury still ordered him to pay child support. In 1943, Chaplin married 18-year-old Oona O'Neill, the daughter of playwright Eugene O'Neill. Unexpectedly the two would go on to have a happy marriage, one that would result in eight children. Later FilmsChaplin kept creating interesting and engaging films in the 1930s. In 1931, he released City Lights, a critical and commercial success that incorporated music Chaplin scored himself. More acclaim came with Modern Times (1936), a biting commentary about the state of the world's economic and political infrastructures. The film, which did incorporate sound, was, in part, the result of an 18-month world tour Chaplin had taken between 1931 and 1932, a trip during which he'd witnessed severe economic angst and a sharp rise in nationalism in Europe and elsewhere. Chaplin spoke even louder in The Great Dictator (1940), which pointedly ridiculed the governments of Hitler and Mussolini. "I want to see the return of decency and kindness," Chaplin said around the time of the film's release. "I'm just a human being who wants to see this country a real democracy . . ."
But Chaplin was not universally embraced. His romantic liaisons led to his rebuke by some women's groups, which in turn led to him being barred from entering some U.S. states. As the Cold War age settled into existence, Chaplin didn't withhold his fire from injustices he saw taking place in the name of fighting Communism in his adopted country of the United States. Chaplin soon became a target of the right-wing conservatives. Representative John E. Rankin of Mississippi pushed for his deportation. 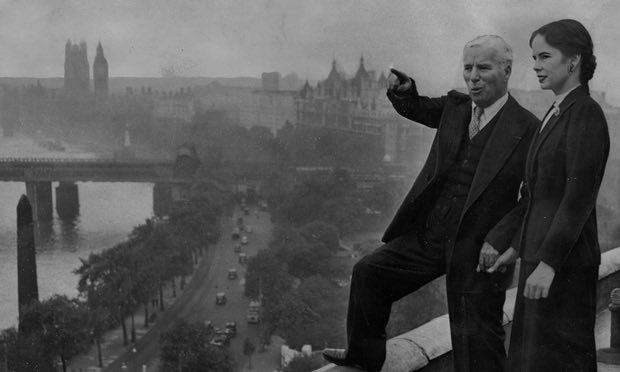 In 1952, the Attorney General of the United States obliged when he announced that Chaplin, who was sailing to Britain on vacation, would not permitted to return to the United States unless he could prove "moral worth." The incensed Chaplin said good-bye to United States and took up residence on a small farm in Corsier-sur-Vevey, Switzerland. Final YearsNearing the end of his life, Chaplin did make one last visit to the United States in 1972, when he was given an honorary Academy Award. The trip came just five years after Chaplin's final film, A Countess from Hong Kong (1967), the filmmaker's first and only color movie. Despite a cast that included Sophia Loren and Marlon Brando, the film did poorly at the box office. In 1975, Chaplin received further recognition when he was knighted by Queen Elizabeth. In the early morning hours of December 25, 1977, Charlie Chaplin died at his home in Corsier-sur-Vevey, Vaud, Switzerland. His wife, Oona, and seven of his children were at his bedside at the time of his passing. In a twist that might very well have come out of one of his films, Chaplin's body was stolen not long after he was buried from his grave near Lake Geneva in Switzerland by two men who demanded $400,000 for its return. The men were arrested and Chaplin's body was recovered 11 weeks later.